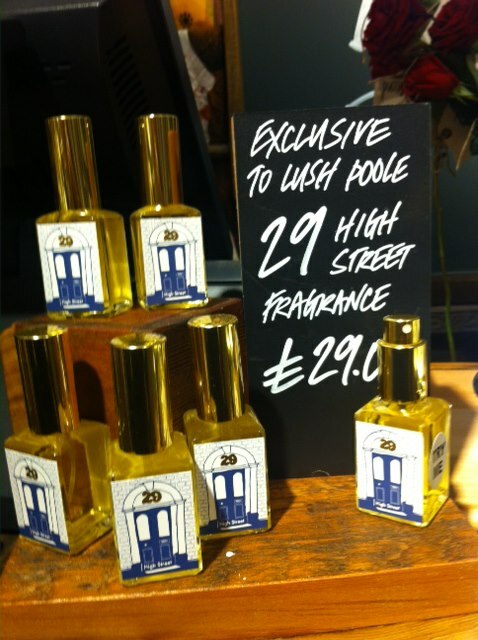 29 High Street perfume, in Lush Spa Poole. When I worked at Lush, customers often asked: “Can I buy this smell? The smell of the shop?”, to which we’d have to reply “no, but here are some other perfumes you might like”. Until, that is, I was working on the Christmas 2012 product perfumes and was given a bath ballistic that looked like the 29 High Street shop in Poole. The ballistic never made the cut, but the scent I developed for it caught the attention of Mark Constantine who asked me to work it up to a sprayable perfume so he could bottle it and sell it at Lushfest (a company event for 2000 staff and customers). So, off I went, and the second variation was bottled. Had I been able to work on it some more I would have probably adjusted the opening – it’s a little sharp for my liking with an overdose of lemongrass – but overall I think the fragrance fits the brief pretty well. It’s like a “shop tour” in a bottle. You get wafts of Honey I Washed The Kids, Karma, Creamy Candy, American Cream, Flying Fox, Butterball, Blue Skies, and of course Avobath, responsible for that lemongrass opening. So how did I do it? How was it possible to cram in the entire tutti-frutti smell of a Lush shop into one perfume? I went into full geek-mode and spoke to our essential oils buyer about the tonnage of materials Lush uses each year. Rather than immediately thinking of individual products, I scanned the list and highlighted all the major materials, then scanned it again and caught all the materials that may not be used in high volumes but have a prominent odour profile. I now had a set of potential building blocks. 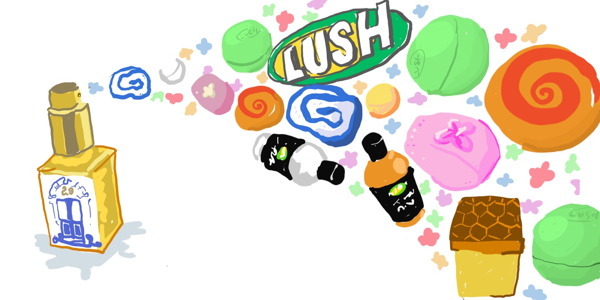 Only then did I start listing Lush best-sellers and picking out themes from each of their product scents. Grant Osborne’s adorable illustration of 29 High Street perfume. Eventually I had an impressionist interpretation of the smell of a Lush shop, which is what was used in the bath product prototype. When I went back to the lab with the formula to work it up to a perfume, I added some extra facets and ended up with less of an impressionist interpretation; more of a sleight of hand where everyone who smells the scent seems to pick out their own interpretation of what a Lush shop smells like. One of the best moments of my entire life was at Lushfest, when we were setting up the Gorilla Perfume shop and a staff member walked past seconds after we had been spraying HQ perfume. She asked to try it and squeaked: “Oh my God! It smells just like the Lush shop!” She had no idea what the perfume was supposed to be about. I realise the Lush Smell is Marmite-ish. If you think it’s awful and wonder how people can work in there, move along, nothing to see here. It’s your worst nightmare in a bottle. If, on the other hand, you are a Lush fan and have always wanted that smell as a perfume, you can now buy the 29 High Street perfume from the Lush shop in Poole. I called it 29 High Street because that’s the shop’s address, but the name of it morphed into HQ at some point. I’m glad to see it in its new bottle and with its original name. This article was originally published at Basenotes as part of my Study Notes series. What a truly remarkable story. Yes, it seems Lush is keen to keep this at the store it was named after (but maybe it will eventually be available on eBay at a far more reasonable price now it’s being continuously made).